The first and biggest 5-day organic festival in the Philippines of the Negros Island Organic Farmers is on December 16 and it will last until 20 at Provincial Capitol Grounds, Bacolod City. As one of the largest fairs of certified organic food product here in the country, it started in 2006 and made a name for the Negros island as "the Organic Food Bowl of Asia" for being the major producer of organic products in the country. More than 100 farmers will showcase their best products like Locavore, native, Artisanal, Vegan, healthy and other sustainable produce. Exhibits will be appreciated at the Organic na Negros! Market and event booths at Gatuslao Street and South Capitol road (fronting the Negros Forest and COA office). Top chefs, restaurateurs and organic farmers all over the country will join also to celebrate this annual organic food and farming festival. Chefs like Ferns Aracama, Ariel Manuel, J Gamboa, and JP Anglo will participate on the first day, December 16, cookingfest competition. While on the second day, it will be participated in by Ian McKenzie, Sau del Rosario, and Manny Torrejon. And many more for this cookingfest will run until the last day. The visitors, promising chefs, HRM students, housewives, and even ordinary people will be benefited from various symposia on technologies on Organic farming, therapeutic effect of functional food, the advantages of slow food cooking, among others on a various schedule. The symposium will be held at the Provincial Capitol Social Hall. There will be also a sponsored organic and culinary tours on the 4th day. For sure, this is a big day for all organics comes Friday. It's 7 days more to go. See you there. i agree with joy, this should be promoted because organic products are really good for our health. this should definitely be promoted. 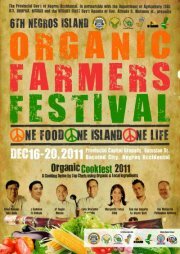 this is definitely something that we have to promote, organic farming and products, go pinoy! Thanks for your comments. Everything that is grown naturally is good. Good for the body, good for our health. Continue your advocacy of organic farming and patronizing organically grown vegetables. I heard about this from some of my friends from Bacolod. Thru this , you aspire to promote organic agriculture and grown naturally , good for health products. Hope people to be aware of this. We will support you Sir! Let's promote organic product, these will help us clean our body for healthy living. The sounds fun and there are lots of activities. I try organic food like tomato, cabbage and okra. And it really feels good,love to eat organic food now.